Days of Our Lives (DOOL) spoilers for the week of November 6-10 tease that Paul (Christopher Sean) will do something he never thought he’d do. He’ll lie about seeing Will (Chandley Massey) inside that Memphis dive. Since Susan (Eileen Davidson) claims Will is still dead, it looks like Sami (Alison Sweeney) and the rest of the gang will be ready to head home. Once Sonny’s (Freddie Smith) released from the hospital, he’ll get dressed and make a decision. Days spoilers say Sonny will finally be ready to let Will go. He’ll trust Paul when he reveals that Will is truly gone. Sonny won’t think there’s anything left to hinder his future with his fiancé. He hoped to find Will alive and well, but he’ll accept what he can’t change. Days spoilers say Paul’s guilt will grow stronger throughout this conversation. When Sonny says he’s ready to tie the knot, Paul just won’t be able to take it anymore. He’ll blurt out that he can’t marry Sonny. Paul will explain his deception and give Sonny the location where Will can be found. DOOL fans can expect some tense moments once Sonny learns the truth. His eyes will fill with tears as he deals with this devastating betrayal. Sonny just won’t know how Paul could do this to him. Paul knew how much Sonny wanted Will back in his life. Since Sonny pushed Will away before he died, he just wants a chance to make things right. The pain has really taken a toll on him, so Paul’s contribution to that will be tough to handle. Days of Our Lives spoilers state that Paul will apologize for his selfish behavior. He’ll admit that he was worried about losing Sonny, but their discussion will probably be cut short. Sonny will definitely be anxious to track Will down and speak with him. He may not even know what he’s going to say. 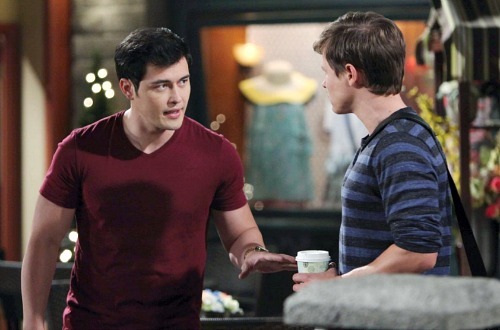 Sonny will just want to see Will in the flesh and figure out his next move. Days of Our Lives spoilers indicate that Sonny will show up at the bar and lock eyes with his love. What kind of reaction will Sonny get? 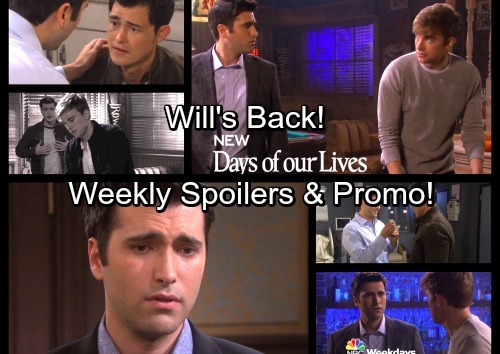 Has Will been brainwashed or will he recall his past with Sonny? Regardless, memories will come flooding back eventually. Some exciting episodes are ahead, so stay tuned! We’ll give you updates as other DOOL news comes in. Stick with the NBC soap and don’t forget to check CDL often for the latest Days of Our Lives spoilers, updates and news.